Radiculopathy refers to compression of nerve roots exiting the spinal canal. Radiculopathy can cause numerous symptoms including weakness, numbness, bowel or bladder dysfunction, and most commonly, pain. Any of the nerve roots exiting the spinal canal can be affected, though those in the low back and neck are most commonly affected. There are many causes of radiculopathy, including degenerative disc disease (most commonly), arthritis, trauma, infection, and cancer. How do we diagnose Radiulopathy? Magnetic resonance imaging, or MRI, is the most powerful tool for diagnosing radiculopathy. MRI uses a powerful magnetic field to produce highly detailed images of the spine. 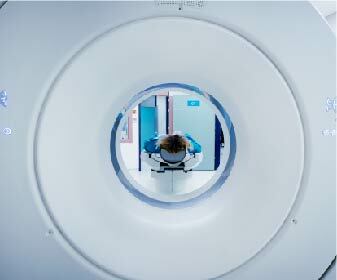 MRI does not use radiation and is not associated with radiation risks or effects. Computed tomography, or CT scans, can be used to diagnose radiculopathy. CT scanners use a series of x-rays and powerful computers to create images of the spine and nerve roots. A related technique called CT myelography adds contrast dye injected into the spinal canal to identify sites of compression within the spinal canal. Often, spine surgeons and pain specialists will order x-rays to look at the bones and overall alignment of the spine and evaluate for any sites of instability that can cause radiculopathy. How do we treat Radiculopathy? Radiculopathy is often by a team of doctors including primary care physicians, spine surgeons, radiologists, and pain physicians. In many cases, the symptoms of radiculopathy can be treated with a short course of anti-inflammatory medications and/or physical therapy. If this fails, a number of minimally invasive procedures can help with the symptoms. Epidural steroid injections are performed by a neuroradiologist or pain specialist. In this minimally invasive procedure, a needle is placed into the epidural space, which surrounds the nerve roots within the lower back, and a steroid medication is injected. The goal of this medication is to reduce inflammation within and surrounding the nerve roots of the lower back, which is often a cause of radiculopathy. Selective nerve root blocks, or transforaminal epidural injections, are similar to epidural steroid injections and are performed under x-ray or CT guidance by a radiologist. These injections are targeted toward the individual nerve roots responsible for the patient’s symptoms. In cases where medications, physical therapy, and steroid injections fail to provide sufficient and lasting relief for radiculopathy, surgery can sometimes be performed by a spine surgeon to decompress the affected nerve roots. Numerous surgical techniques exist and are best discussed with your surgeon.